Kathy Shore Nursery is proud to offer beautiful, real Fraser Fir Christmas Trees, White Pine Christmas Trees, and Concolor Christmas Trees. The great debate surrounding Artificial Trees vs. Real Trees happens every year, but we guarantee that one look at the beautiful Christmas trees at Kathy Shore Nursery will be enough to convince you that real trees are far superior to their artificial counterparts. 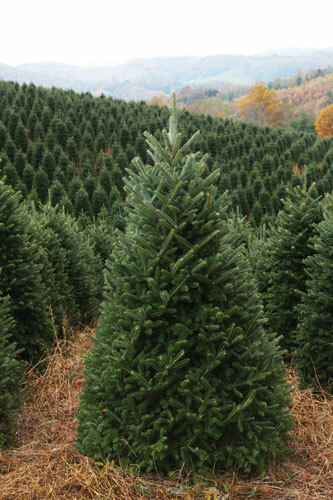 Real Christmas Trees are grown on American soil thus making an important economic contribution to many small towns and communities in the United States whereas Artificial Trees are often produced overseas in countries like Korea, China, and Taiwan adding to the US trade deficit. Real Christmas Trees absorb harmful gasses and release fresh oxygen into the air. One acre of Christmas Trees provides enough daily oxygen for 18 people. All of the trees in the United States combine to provide enough oxygen for nine million people daily! Fake Christmas Trees are manufactured using nonrenewable petroleum-based plastics, using up natural resources that can never be recovered. Manufacturing the metal and plastic components of artificial trees adds to pollution and consumption of energy. Real Christmas trees are renewable, recyclable, and reusable. After the holidays Christmas trees that are balled can be replanted, and Christmas trees that were cut can be chipped into biodegradable mulch to be used in home landscaping projects or in parks. Real Christmas Trees can be used in many different ways following the holiday season. Some coastal towns use the trees to create barriers that help prevent erosion. Sinking your tree into a pond is a great way to create a refuge or feeding area for fish. Fake trees last forever. They are not biodegradable and will sit in landfills for thousands of years. Contrary to popular belief, the chemicals in artificial trees make them more of a fire hazard than real trees are, and when fake trees catch fire, they emit dangerous and toxic fumes. There really is nothing quite like the smell of a fresh North Carolina Christmas Tree wafting through your home around the holidays. Christmas is a special time of year for many families. This year, when you're deciding between an Artificial Tree vs. Real Tree, choose a beautiful Fraser Fir Christmas Tree, White Pine Christmas Tree, or Concolor Fir Tree from Kathy Shore Nursery. While you’re here, make sure to browse our selection of Luxury Christmas Garland and Christmas Tree Wreaths, both of which are perfect ways to bring Christmas into your home!